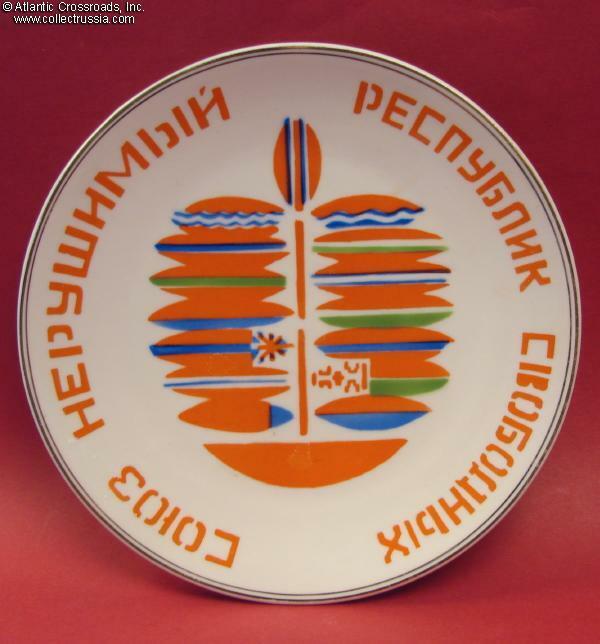 Porcelain Wall Plate "The Union Unbreakable of Free Republics" by the Korosten Porcelain Factory, 1962-1991. Measures 7" in diameter. 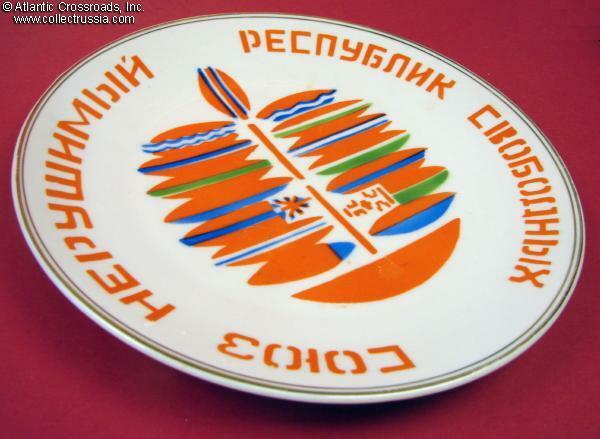 Surrounded by words from the first stanza of the Soviet anthem, a stylized tree bears leaves in the colors and patterns of the member republics' flags. 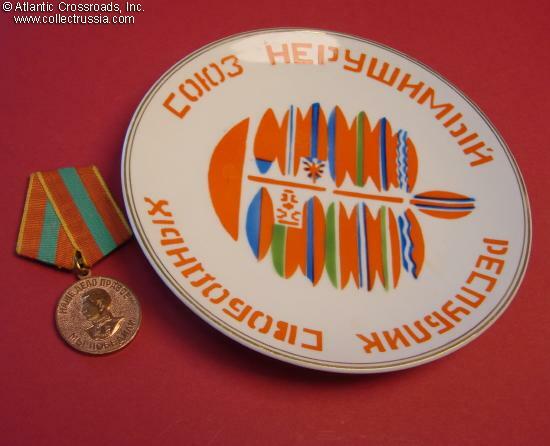 The text is that of the first words of the national anthem of the Soviet Union. The Korosten trademark in green appears on the reverse /same as fig. 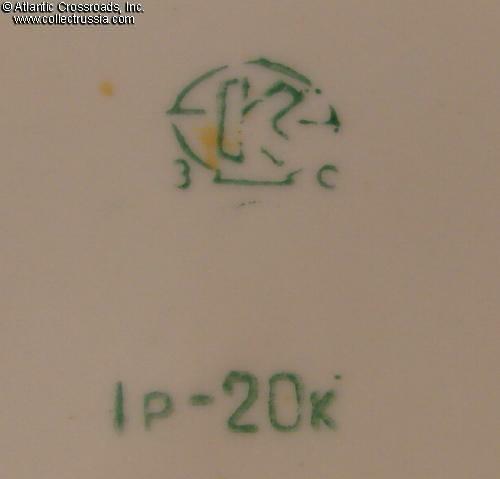 #384 in Volume One of "Marks on Soviet Porcelain, Faience, and Majolica, 1917-1991 by Nasonova et al"./ The trademark also indicates that this is a "third sort" item, meaning that it was intended for domestic sale within the borders of the Soviet Union and was not intended for export. Its 1 ruble 20 kopeck price is also stamped on the reverse. 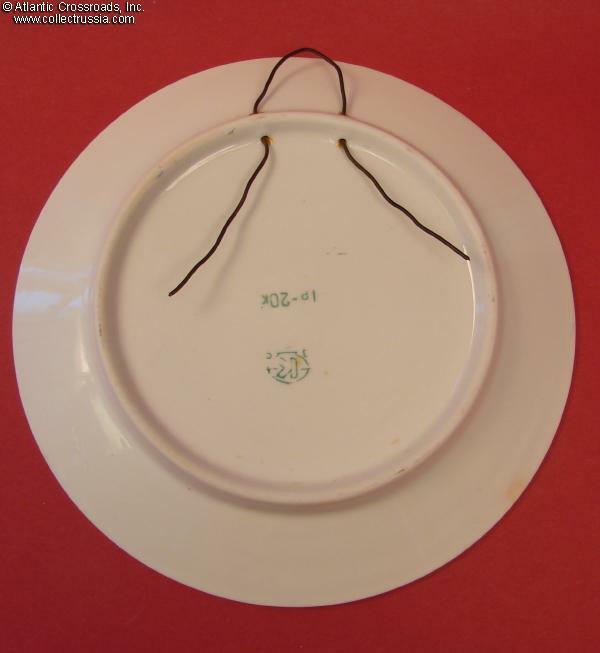 Like many plates intended for wall display, this has two holes on the back and it already has a particularly strong length of wire already in place; we've tested it and it works well. Excellent condition. The gold trim on rim is uniform and bright as are the colors of the stylized plant leaves rendered in the colors and designs of the republic flags.